Intermediate autonomous technology and relay driving are mutually symbiotic as together, not only can they make trucking safer and cheaper but also build a strong foundation for building fully autonomous vehicle technology. The primary goal of autonomous vehicle technology is to increase road safety and cost efficiency in the long-term. Advanced autonomous technology (Level 5) requires no human intervention and can deliver highest safety standards. However, to build Level 5 autonomous technology, one needs data to model and train algorithms on not only all known cases but also unknown cases (events that have never happened before). While responding to unknown cases, human drivers use an instinctive framework to respond. The instinctive response comes from human consciousness which is potentially a storehouse of an individual’s ethics. It will require considerable effort to align on a code of ethics that is agreeable to society at large in order to build systems around it. Intermediate autonomous technology (Level 3 and Level 4) are interesting as they potentially achieve the same levels of safety standards as Level 5 technology with human driver assistance. This also paves the way for Level 5 as more and more data becomes available from intermediate technology vehicles. Additionally, this can help create a framework to develop the code of ethics over time, while minimizing any immediate impact on jobs and thus reducing any possible regulatory pushback. It does not undermine the goal of building progressive technology and has the potential to reduce costs in the near term through deskilling of a driver’s job. In the case of trucking, the biggest issue that the industry faces is a severe paucity of truck drivers. This is primarily due to a poor lifestyle culminating from spending weeks away from home for line haul truckers. The solution to the paucity of drivers is two folded and technology driven – (i) make trucking a regular day job using a driver relay system, and (ii) use semi-autonomous technology to make the job safer and more efficient. The driver relay model coupled with the level 3 autonomous vehicles cam solve the issues associated with trucking and provide a cheaper and more plausible future than fully autonomous trucking. Intermediate autonomous technology and relay driving are mutually symbiotic as together, not only can they make trucking safer and cheaper but also build a strong foundation for building fully autonomous vehicle technology. 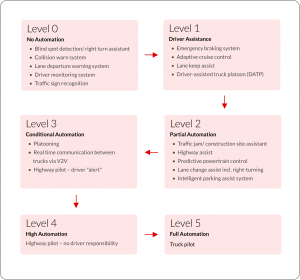 Autonomous vehicles are typically defined in five clear levels as shown below. In a recent paper published by Roland Berger on the topic, the level of features needed to go from one level to the next were analyzed. This is summarized in the image below. The key takeaway is that the data requirements increase exponentially with each level. In the current scenario, focusing on stage 2 and stage 3 is possible with the available data. However, to reach level 5, the level of prediction accuracy needed translates to unimaginable data requirements. The biggest technical challenge for fully autonomous trucks is the availability of data and training capabilities. Today, most work on autonomous vehicles has been done by two tech giants, Waymo and Tesla. Both of these companies are racing to collect and process insurmountable data to create a car which can make human driver decisions flawlessly. Tesla is using hundreds of thousands of cars it has on the road by collecting real-world data about how those vehicles would perform with Autopilot, its semi-autonomous system. Waymo, which started as Google’s self-driving car project, uses computer simulations and feeds what it learns from those into a smaller fleet deployed on road. What is not very clear is how much of real autonomous data Tesla would have. The total number of fleet miles driven by Tesla cars had jumped over to 5 billion+. However, how much of the data from these miles is from autopilot and how much has been sent to data processing centers given the data privacy regulations remains unclear. The only other giant with similar amounts of data is Waymo, which announced that it has simulated 5 billion miles of autonomous driving. The company also said it has notched 5 million self-driven miles on public roads. That’s possibly more than every other company testing self-driving vehicles combined. But the validity of simulated data to learn all the possible events to create human less vehicles remains a question. This is because it has less than 1000 real vehicles moving on road to feed the simulations. To understand the amount of data required to make the full autonomy work, let’s take an example of a system that has progressed well on the path of autonomy, Image tagging. It is crowd sourced like Amazon Mechanical Turk, wherein you upload an image and it creates tags which can be used for searching of the same online. This project started with a data set (ImageNet) containing more than 12 million images with 20 thousand categories labeled on them. It had started as a competition, but it took 6 years to reduce the error rates to less than 5%. If the amount of data and computational power required to create an identification tag from an image is so huge, one can imagine what it would take to replace a human driver in all possible weather conditions, road conditions, interactions with other humans on road and their behavior. It means predicting literally every single thing around the vehicle with very high accuracy. This translates to the need for data of trillions of real driven miles. Research by scientists at RAND estimates the amount of data needed to statistically prove that full autonomy is safer than human driving is 11 billion miles of actual autonomous driving on road. With a fleet of 100 autonomous vehicles test driven 24 hours a day, 365 days a year at an average speed of 25 miles per hour, this would take about 500 years. The main advantage of fully autonomous trucks is the cost saving in terms of driver cost as opposed level 3 or 4 with the driver assist models. This, too, is likely to be nullified due to additional development and regulatory costs. Other than the reduction in driver cost, there is no significant difference in safety levels. With level 3 or 4 coupled with relay driving, safety levels of fully autonomous vehicles can be achieved with cost-effective models. A RIVIGO pilot (truck driver) sets off on a 250 km journey from his home pit stop and hands over the truck to another pilot at the next pit stop, pretty much like a baton in a relay race. There is a mandatory rest period for pilots at pit stops. After resting, the pilot drives a truck back to his home station. The biggest success of the relay model is that it enables bringing the pilot back from the destination pit stop to home pit stop within 12 hours of his starting time. Managing this with clock-work precision in a highly dynamic environment at scale is impossible to do without solid technology. We use a trip dispatch scheduler (TDS), which applies complex dynamic programs to optimize for driver wait time and manages the arrival/departure of vehicles at every node in the network. Each vehicle is equipped with sensors for location tracking and engine monitoring. Vehicles and pilots are auto-allocated on trips based on availability and past performance on similar trips. In simple terms, we have envisaged the truck as an Internet of Things platform (or as we call it, Internet of Moving Things) with smart sensors that constantly interact with a responsive logistics network. The pilot, meanwhile, is given a smartphone so he can track his upcoming trips, vehicle details, travel reports, QR codes for trips, details of the handover driver, among others. The emphasis on pilots and technology is already showing results. While the average distance recorded by the industry is about 15 km per hour, our trucks clock at least 50 kilometers at least. We are also able to ensure a 50% to 70% reduction in transit time. The symbiotic relationship between Level 3 autonomy and relay is in two major areas. These are safety and cost. The top six safety features which address majority of the safety concerns today are taken care of by level 3 autonomous vehicles. When combined with relay, accidents due to human errors can be fully eliminated as relay pilots drive shorter intervals with mandated rest. Hence, the safety levels of level 5 autonomous vehicles can be achieved. As for cost, relay is significantly reducing driver cost by fundamentally transforming the job role to a day job and through local hiring. When combined with Level 3 autonomy, the job can be significantly deskilled, thereby further reducing cost. Relay enabled semi-autonomous driving is the future of trucking. Fully autonomous (Level 5, without driver) vehicles are commercially viable only under the condition that they improve both cost and safety significantly. However, given the unimaginable amount of data required and the cost of development including cost of sensors (incremental cost of sensor till level 3 is around 13K USD per vehicle and the level 5 is 10K USD) raises a question on the imminent possibilities. Governments may also levy higher taxes to compensate for lost jobs due to full autonomy, thereby increasing costs further. On the other hand, driver relay combined with level 3 autonomous technology has significantly lower development and operational cost. The deskilled regular day driver cost is also lower due to relay. Further, the safety levels will be the same as level 5 vehicles. The interaction between fully autonomous and human driven fleets was unknown and it is a very significant step towards operationalizing autonomous trucking.